In Death Matters, you take on the role of a different settler every time you're killed. 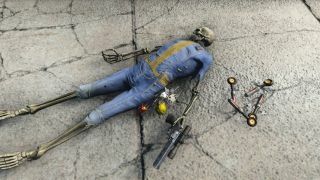 If death doesn't have enough meaning for you in Fallout 4, this mod will encourage you to respectfully mourn every time you're battered apart by a deathclaw. In OW3Nx25's Death Matters (get it on Nexus here), each time you die you have to retrieve every non-quest item from your corpse, wherever you left it. Upon respawning, you take on the role of a settler from your nearest settlement—or Sanctuary, if there aren't any suitable settlements nearby. Your journey to retrieve your items will then come up as a quest. The stakes are pretty high: your new character only has basic weapons and armour, and dying again will make your old body vanish for good. Keeping your settlements active is important, because for each respawn, the settler you're playing as is gone forever. You'll have the same appearance as your old self, though. Death Matters brings, dare I say it, a Dark Souls-like tension to your journey through the Commonwealth, and OW3Nx25 suggests activating the mod in tandem with the game's Survival mode. The only caveat is that it doesn't work with Fallout 4's DLC locations, so keep that in mind if you want to try it out. Check out our list of best Fallout 4 mods if you're looking for enhancements, new locations or anything else.